This blog contains a wealth of information about the opportunities, schemes, awards, tools, services and advice that is available to you whilst you are studying at the University. 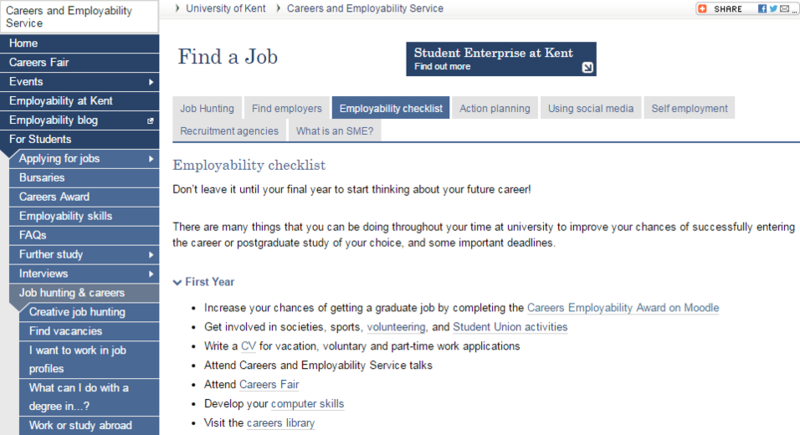 If you would like any further advice about how you can enhance your employability skills and prospects, get in touch with the Careers and Employability Service or Jon Beer in the first instance. It is important to remember that as a student at the University you are responsible for your own learning and development, and it is up to you to take advantage of what is on offer, to expand and enhance your employability skills and prospects. You are strongly encouraged to consider how you would like to approach your employability development, and to set out a plan to do it. Consider the career options available to you, and what you would like to do after you graduate, and aim for that. Consider how you can make yourself as attractive to potential employers in your chosen field as possible, and work towards it. That being said, remember that you do not have to choose a career immediately, especially in the modern job market. You should explore all the avenues that are open to you, try new things and test your abilities. You can do this while you are still a student – many students who study abroad for a term or a year, or who do a year in industry, do so to obtain experience of something they would like to do later in life. At the end of the day, it is your life, and your career. In spite of the myriad external pressures, you should make your own path. The School of History and the University of Kent will do all it can to support you in achieving the very best that you can.